I emailed Origin about this and say they think they know what it is and it is affecting the whole DR network. Should have an update soon. Welcome to the forum and thanks for getting involved! As you say this is affecting the whole DRL platform and all ISP’s are experiencing the increased latency time problem. The NOC are aware of the problem and hope to resolve it as quickly as possible. There is no need to individually report this to your ISP as they are aware of the issue and working with the NOC to resolve it. I will update once the problem is believed to be resolved or any updates come through. @SpencerUk Thanks. Based on that I am either SHA018 or SHA042 but I've never had speeds over 30Mbps! 28Mbp is the 'norm'. (06-04-2012 04:26 PM)mattyatty1 Wrote: I don’t think it’s down to the increase in customer take up of DRL to be honest. All of the ISP’s have different routing, transit providers and levels of interconnects so pings would vary between ISP anyway. The increase would be a gradual rise where as it appears this has happened all of a sudden. 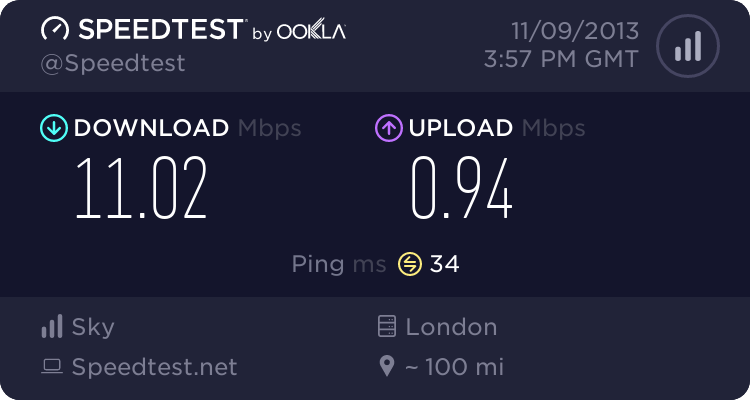 If you think BT, Virgin Media, Sky etc all have thousands of customers on both ADSL & VDSL circuits and there pings are a lot lower than my current 70ms ping times! Looking at the connectivity links on the DR network, I think it could be, but I don't know how much traffic is going through it. With the majority of users I would imagine being on ASK4, I assume network platform as well as the Radius is shared..Could be that..who knows!. Can't beat my pings of over 100ms on DR at the moment!. 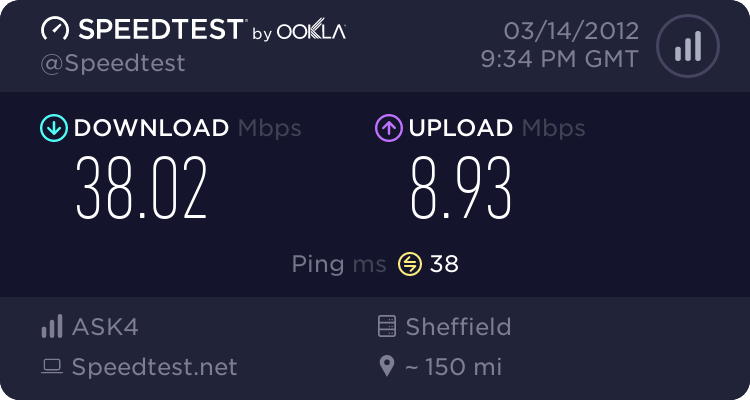 My BT Infinity connection is at 16ms lol. (06-04-2012 04:37 PM)Vardant Wrote: I emailed Origin about this and say they think they know what it is and it is affecting the whole DR network. Should have an update soon. Are they referring to network as a whole being Digital Region or do they mean just the Origin network?. The network issues are affecting DRL as a whole. The whole network for all ISP’s connected is currently seeing an increase in ping times. The NOC/Thales is aware and working to get the issue sorted ASAP. I normally get a ping on Origin of around 25ms so I can’t usually complain with that! (06-04-2012 10:48 AM)aceado Wrote: might be an idea to say which location your from with the cabinet number and the exchange ?? i wonder if this makes any different ? That won't matter as the latency is before those hops (on the DR network). hi guys, found this sight nd im getting worse connection and pings to. do u guys think it cud only be some exchanges, im in cudworth exchange, which exchange or cabs are u guys getting ur connection from? Also do u guys have faith in your isp/dr to fix this or other problems i have logged 2 faults before and on 1 i thought they were really spot on and fixed the cab quickly when it was a hardware prob, the other 1 my line was bad and i was not so sure about how they fixed it because it take a lot of time for my isp to come back. @eric.honecker welcome to the forum and thanks for joining in! (07-04-2012 09:33 PM)eric.honecker Wrote: hi guys, found this sight nd im getting worse connection and pings to. do u guys think it cud only be some exchanges, im in cudworth exchange, which exchange or cabs are u guys getting ur connection from? I'm on the Cudworth exchange myself . Just to be clear, you are not really routed to your local exchange..We are routed to Barnsley central. Do I have faith in Thales/NOC fixing it?..Nope..To be honest, I don't think it will be fixed until a new partner takes over tihs network. any news on a new partners yet @SpencerUK ? The application for tender is next month so we should know more by that point. If I was the Thales/NOC team, I wouldn't look at fixing the network. Lets face it, whoever comes in is going to get shut of them as they will be maintaining the network. It's not cost effective for them to put so much manpower into it if they are outgoing from it all. Just my 2 pennies on it but it makes sense.